Plantar fasciitis is and injury common among athletes and non-athletes. In its simplest terms it is an inflammation of the plantar fascia, resulting in pain throughout the foot and the arch. It is often the cause of runner heel pain, and can be very debilitating, lasting for months if not treated correctly. The plantar fascia is a wide band of connective tissue that covers the bottom of the foot. It extends from the heads of the five metatarsals along the arches and inserts on the calcaneus. Because it is connective tissue, it is considered non-contractile. The plantar fascia helps to provide support to the muscular arches of the foot. Inflammation of a tissue occurs when the stresses placed on that tissue are greater than it can handle. While inflammation is a necessary part of tissue healing, chronic inflammation can cause pain, swelling, loss of motion, and decreased function. Signs and symptoms include pain and discomfort along the bottom of the foot, from the heal to the balls of the feet. One of the most common complaints is severe pain with the first step out of bed in the morning. Runner heel pain may also be a common symptom. There may be a feeling of tightness throughout the arch. When pushing on the bottom of your foot, you may feel small areas of hardness, like little pieces of gravel or knots in the tissue. Pain and discomfort often decreases as the tissue warms up and stretches out, only to return with prolonged activity. One of the most common causes is poor calf flexibility. When the calf muscles are tight, this limits the amount of motion available to the ankle when walking. The motion of pulling your toes towards your head is called dorsiflexion. Limited dorsiflexion places an increased amount of stress on the arches of the foot and the plantar fascia. This increased stress can often lead to inflammation, pain, and discomfort. Another common cause of plantar fasciitis can be the biomechanics of the foot during the gait cycle. During walking or running, the foot is required to absorb a significant amount of stress. In order to fully understand this, lets look at the gait cycle a little closer. The second phase of gait is called foot flat. This occurs when your foot is flat on the ground. In normal biomechanics, the foot should be in a slightly pronated position. Pronation is a combination of motions, the opposite of supination, but simply put is when your foot is turned out slightly and more weight is placed towards the insides of your feet. In a pronated position, the small bones and joints of the foot are open, and they are able to absorb the stress and shock of walking. This means that from heel strike to foot flat, the foot is moving out of supination (the outside of your foot bearing more weight) and moving to a pronated position. The third phase of gait is called push off, or toe off. This occurs as you begin to lift your heel, rolling onto the balls of your foot and pushing yourself forward. With normal mechanics, the foot should be in a slightly supinated position once again. Supination causes the joints of the foot to lock down, and creates a rigid lever to propel you forward. The biomechanical problems occur when you spend more time in either pronation or supination during the gait cycle. By far, over pronation is much more common than over supination. Remember, pronation places more weight on the inside of your foot. This means that increased amounts of stress are being placed on the arches and soft tissues. This increased stress can cause plantar fasciitis, and is a very common contributing factor. Improper footwear is another common cause of plantar fasciitis. Athletic shoes that do not have proper arch support or adequate support of the heel can lead to altered biomechanics and increased stress on the soft tissues of the foot. Treatment is made up of several key ingredients. As there can be numerous causes, addressing each helps to achieve the most effective results. Treating the pain and discomfort of plantar fasciitis is achieved through the use of ice and massage. Regular applications of ice, especially following activities and during periods of increased pain can help to decrease inflammation in the area, as well as reducing pain. 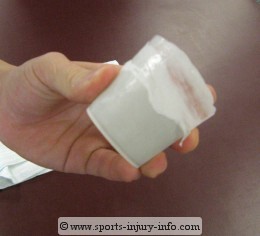 Ice massage is generally very effective in treating plantar fasciitis. Massage is another excellent treatment option. Rubbing of the plantar fascia helps to reduce some of the "knots", and allow the tissue to return to its normal state. With chornic plantar fasciitis, there is often a buildup of inflammation in the area, which can be reduced through massage. Massage also helps to increase blood flow to the area, aiding the healing process. While treating the symptoms is important to provide relief, without treating the underlying cause, your symptoms are bound to return. So to treat the actual cause, you need to improve flexibility and ensure you are wearing the right shoes, and account for any biomechanical problems. A good stretching regimen for the calf muscles is important in the treatment of plantar fasciitis. Daily stretching of the calf can help to reduce the stress on the soft tissues of the foot. Calf stretches should be performed 2 or more times a day, with each session consisting of 4-5 stretches, held for at least 30 seconds. Proper footwear is important as well. You should choose a shoe that is right for your activity. Good arch support, a strong sturdy heel box, and an adequate amount of cushion are all important in treating and preventing plantar fasciitis. Even with great shoes, sometimes our bodies just don't cooperate. The biomechanics of your feet, and whether you are a pronator or supinator cannot be "fixed". They can be treated. 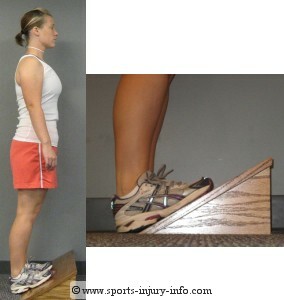 Often an insert can be placed in the shoe to help account for over pronation. These orthotics help to bring the foot into a more neutral position, decreasing the stress on the plantar fascia, and limiting symptoms of plantar fasciitis, like runner heel pain and arch soreness. There are many available pre-made orthotics on the market for treating plantar fasciitis. Ask your family physician or certified athletic trainer for recommendations. If you are currently suffering from achilles tendonitis, plantar faciitis, ankle, or foot pain, you could benefit from a comprehensive foot and ankle strengthening program. 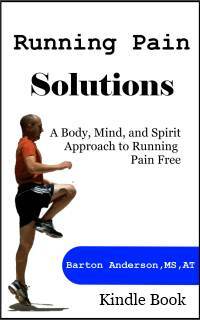 Foot Pain Solutions is exactly what you need to help eliminate your foot, ankle, and low leg pain. Great for prevention too, Foot Pain Solutions can guide you to finally getting rid of your chronic foot and ankle pain. Plantar fasciitis can be a frustrating and chronic injury. Proper flexibility, conditioning, biomechanics, and footwear can all play an important role in preventing and treating this condition. Understanding its cause, and what you can do to improve is the key to successful treatment of plantar fasciitis. If you have been suffering from foot pain for more than a few weeks, or if you have been doing all of the above things and are still having discomfort, you should see your family physician or certified athletic trainer. You may be in need of a thorough biomechanical examination, as well as plantar fasciitis treatments you cannot provide on your own. Iontophoresis, therapeutic ultrasound, and therapeutic electrical stimulation may be of benefit.